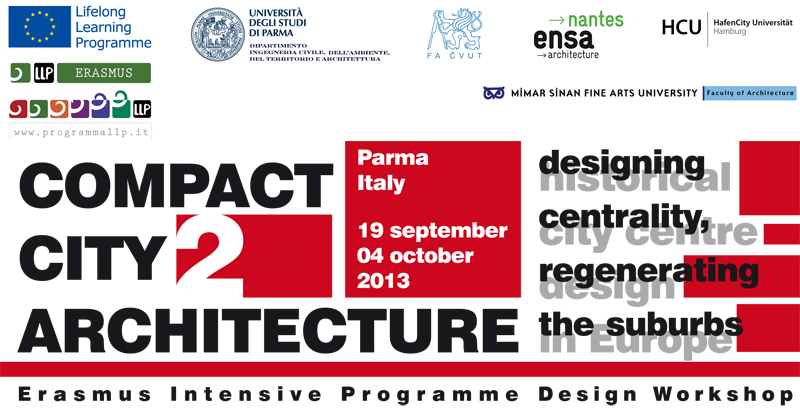 After last year’s experience of designing for the historical nucleus of the city of Parma, namely, to transform the University Campus in the Oltretorrente district, the IP Erasmus Project entitled “Compact City Architecture: historical city centre design in Europe” means to extend its attention to take in those parts of the city dating to a more recent historical phase. As a result, we are looking at the parts we call the “suburbs”, generally characterized by factors of sprawl and the opening up of spaces to such an extent that they lose their architectural conformation, resulting in an urban identity that is ambiguous and no longer ascribable to either the morphological or social conditions nor the administrative framework of the compact city. In the face of these and other critical situations, the suburban surroundings, in any event heavily populated and constituting the factor of greatest settlement weight in the body of the city, make themselves available for various densification strategies, above all to reiterate the premise before putting an end to the indiscriminate expansion of the settlement and subsequently verify the possibility of reassuming the conditions of morphological characterization and liveability typical of historical urban nuclei. At this point it is permissible to ask ourselves: should we reconsider the suburban settlement in the key of the historic city, between density and formal articulation, or turn to other compact city models that have nonetheless been tried and realized in the experience of modernity? Or again, might there exist a third way to marry these often contrasting models according to a dialectic operation that also takes into account the contextual peculiarities of each city? In the face of these uncertainties the project can anticipate different scenarios, that must nonetheless be capable of competing on the shared objective of re-conferring spatial and functional quality representative of the body of the city, which is by nature heavily composite but at the same time unitary. An operation, the latter, which veers in the direction of a “structural smart city”, where the quality of a presumed intelligent city is chiefly organized through the primary prerogative  that a city is a phenomenon of a spatial nature. Within this problematic context, the project experimentation applied to the Sant’Eurosia neighbourhood in Parma introduces the theme of density conjoined to the idea of urban centrality, where by centrality is meant a point that is differentiated with respect to the repetitive continuity of the settlement fabric, where we can come upon the city’s main formal, functional, but above all representative components, chiefly of a collective nature. A central nuclearity that can structure and catalyze the fragmentary and heterogeneous diffusion of the suburban settlements, assuming its own strongly evident role, that of a bona fide “manifestation”, measuring itself against the theatricality of expression of an urban landscape seen as a setting.